Inscription: (Recto) at top right, inscribed "Gestus magis largi longiq[ue]/brachijs extensis, A" (twice), "lag" in brown ink by Rubens; (verso) inscribed "vel Medea respiciens Cresuam ardentum et Jasonem velut Inseguens..." in brown ink by Rubens; faintly inscribed "Creusa ardens[s(?)] in red chalk by Rubens. The recto or front of this sheet depicts three independent groups of apostles and two faint, lightly drawn sketches all related to a representation of the Last Supper. 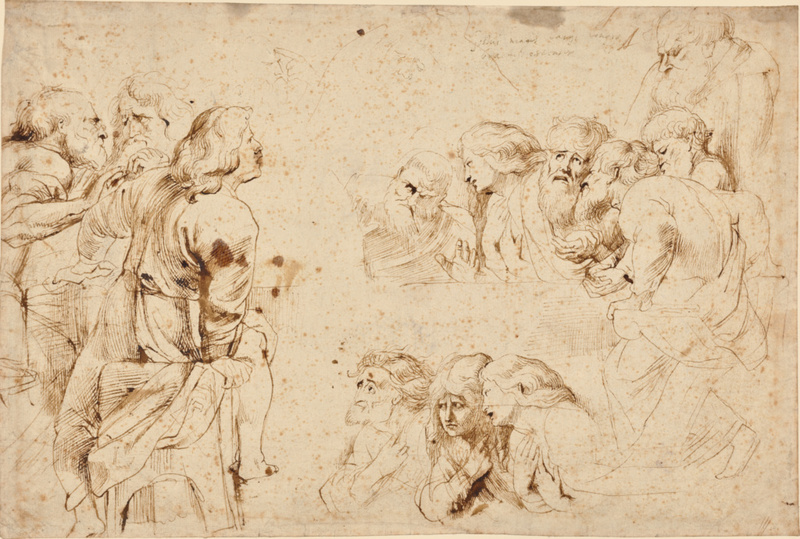 Peter Paul Rubens drew on many Italian models, including works by Leonardo da Vinci, Caravaggio, and Michelangelo, for inspiration in depicting the individual apostles. 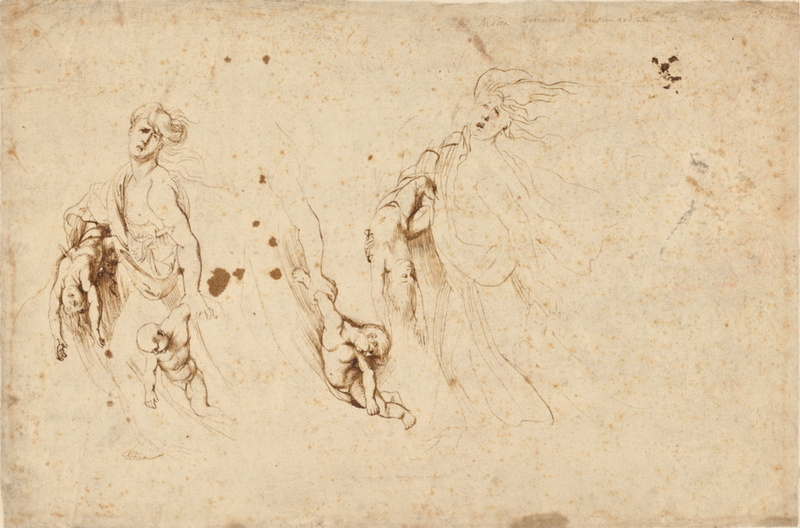 Rubens used a thin, fine line for the monumental figures of the apostles and cross-hatching to convey their solid forms. The verso, or reverse side of the page, shows several studies of Medea and her slain children. According to Greek legend, Medea, a princess of the foreign kingdom of Colchis, was married to Jason, who eventually left her to marry a native Greek woman. A passionate and jealous woman, Medea stopped at nothing to obtain revenge, including murdering her own children. On the right, long, sweeping lines animate the figure of Medea, whose gaping mouth seems to emit anguished wails. Rubens depicted her striding forward as she roughly carries her children, their bodies limp in death.